The north building of Toronto’s St. Lawrence Market in 2013. The view gazes toward the northwest corner of Jarvis and Front Streets. In the background, on King Street East, are the St. Lawrence Hall and the spire of St. James Cathedral. The north building of the St. Lawrence Market was situated on the original site of York’s (Toronto’s) first farmers’ market square. At first, the market square was simply an open field with a water pump, where local farmers sold their produce and livestock. Early, each Saturday morning, farmers arrived from neighbouring townships, having departed their farms long before daybreak, travelling by horse and cart along the muddy roads that led to the town of York. About the year 1815, at the north end of the square, adjacent to King Street, they erected a small wooden shelter, measuring 35’ by 40’. In 1820, the sides of the structure were enclosed to form a brick building. However, in 1831, an impressive quadrangular market complex was constructed, stretching from King Street on the north to Front Street on the south. In the foreground of the above picture is the north facade of the red-brick market building on King Street East. The facade had three archways, each located above an entrance to the building. The complex included a rectangular courtyard for farmers’ carts and wagons. Surrounding the courtyard were sheltered spaces to accommodate stalls for butchers, fish merchants, and vegetable sellers. The covered sections protected vendors and customers from the whims of York’s (Toronto’s) cruel winter weather. 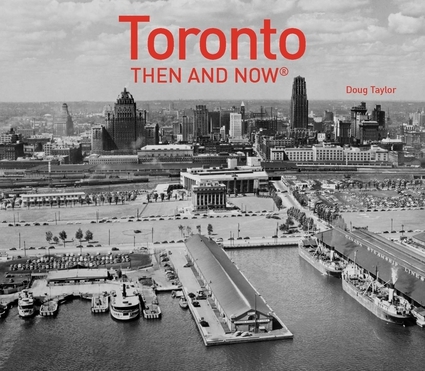 In 1834, the town of York was incorporated as a city and renamed Toronto. Because there was no City Hall, for a decade after its incorporation, city officials met in the red-brick structure on King Street, at the north end of the St. Lawrence Market complex. In 1849, a fire swept along King Street that destroyed the market. When they rebuilt in 1851, the new two-storey market building was a mixture of architectural styles, with windows topped by Roman arches and others that were rectangular. On the north end of the site, a grand hall was added – the St. Lawrence Hall. It became the cultural centre for the city, where citizenry gathered for recitals, concerts, and important speakers. Painting depicting the north market of the St. Lawrence Market building, in 1898. This is the structure that was erected in 1851. The view gazes from the southeast corner of Front and Jarvis Streets, the cupola on the St. Lawrence Hall and the spire of St. James Cathedral visible in the background. Toronto Public Library, r- 5181. Photo taken in 1898, showing the same view as the painting. It is likely this photo was the inspiration for the painting. There were streetcars on Front Street. Toronto Public Library, r- 6039. View of the east and south sides of the market building erected in 1851. The cattle are being herded east along Front Street. The streetcar tracks are visible, even though the roadway is unpaved. The photo is undated but is likely c. 1898. View of the east side of the market, looking north on Jarvis Street toward King Street East. The sign for W. E. Dobson Cigar Factory on the south wall of the St. Lawrence Hall belonged to a company that operated from 1883-1898. Toronto Public Library, r-6041. In 1899, the north market buildings was demolished and another structure erected. Construction was completed in 1904, the architect being John W. Siddal. The style of the building matched that of the south market structure on Front Street. I was inside this building many times during the 1950s and 1960s. I remember its architecture as being rather dreary, its interior cavernous, and on cold days it was drafty. Because the windows were built high up in the walls, it was not well lit, especially on winter mornings. The brick walls and cement floors added to its austerity. However, the colourful activity on Saturday mornings more than compensated for the structure’s dismal appearance. The interior was composed of one main, open space, the overhead beams visible. At the north end there was a stage to allow the building to be employed for political meetings or community events, as well as entertainers. Unlike the south market, where there were permanent kiosks and stalls, merchants sold their goods from folding tables, which were set-up every Saturday morning. The farmers paid a rental fee to acquire a space. This building was demolished in 1968. Plans drawn in 1900 that depict the design for the building to replace the north market building erected in 1851. City of Toronto Archives, Fonds 1465, File 0425, Item 0006. Painting showing the north St. Lawrence Market c. 1945. The view is of the west side of the structure, the St. Lawrence Hall visible on its north side. Scene in the north market in 1957, the folding tables visible for displaying goods. Canada Archives, 010955318. In 1968, a sleek new building was erected. I was in this building on many occasions as well. It was as spacious as its predecessor, the equivalent of two storeys, though not as cavernous. Its walls were composed of light-beige (almost white) bricks. On Saturday mornings, when the farmers’ market was held, the interior was brightly lit. In warm weather, around its exterior there were stalls for farmers who were unable to rent interior spaces. On the north end of the interior there was a stage to accommodate community events. On Sunday mornings, the building was employed as a flea market. During the remainder of the week, the interior space was available for rent. Aerial view of the north market building in the 1970s or 1980s, the camera pointed east. On its north side (left-hand side of the photo) is the St. Lawrence Hall, its cupola possessing a green copper roof. Toronto Archives, Fonds 1526, File 0016, Item 0003. View in 2012 of the north market building’s south facade on Front Street, the spire of St. James Cathedral and the cupola of the St. Lawrence Hall in the background. Interior of the north market building on a Saturday morning in 2012. Interior view, showing the stage at the north end of the space. Spaces for farmers’ stalls on Jarvis Street, on the east side of the north market building. Vendors on the east side of the north market building in 2012. Vendors’ tents on the west side of the building on an autumn Saturday morning. View from the southeast corner of Jarvis and Front Streets in October 2016, the hoarding around the building to facilitate its demolition. Artist’s concept of the new structure to replace the former north market building. View looks from the southeast corner of Jarvis and Front Streets.